Read, explore, smile, cry and never give up as you come along with Priscilla for the ride of your life that happens right here, online, before your eyes. According to a number of online statistics, nearly 95% of us that manage to lose weight will gain it back. It is almost enough to make us give up and never even bother trying. Diets, crazy fads, in-home exercise equipment that gets turned in to coat racks, gym memberships that don't get used and millions of other self-made problems that stand in our way have finally driven me to take my health in to my own hands. Again. Though some people have found permanent weight loss solutions by going under the knife, the health risks involved scare me from trying this. In this day of wanting instant gratification and lunchtime weight loss, it is tempting but is one of the only few things I haven't tried. My very personal look at weight loss is coming from a different place... that weight loss is a real journey and should be fun, though sometimes frustrating. What I have believed to be true for my entire 47 years on this earth, the thought that I will ALWAYS be fat, is tough to get over. I MUST LOSE WEIGHT. 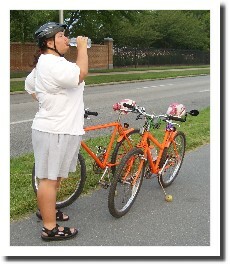 With a high weight in May 2006 of 440 pounds, my body went down to 250 after spending 6 months bicycling 3,000 miles, then a knee injury that ended my riding and many other factors helped my weight creep back on. Old habits die hard and I have a LOT of old BAD habits when it comes to eating. You are invited to start making Little Changes with me. Free. No strings attached. 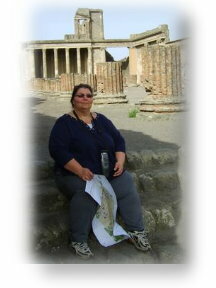 Just come along to this site where I will be logging all my adventures and wonderful little changes. You will even be invited to come along on some amazing trips and adventures! Our struggles may be the same or different, it doesn't matter. Our stories may help us get inspiration from each other. As long as we are trying, there is hope. Remember, anything is possible with enough little changes. Motivation is something that we all need every day of our lives. I have found that we get more motivation every time we try to give it away to others. 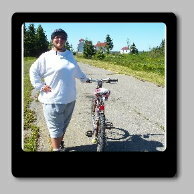 After bicycling and walking over 3,000 miles to lose weight & spread the word that exercise works! Forget everything that you thought was possible or impossible! At Little Changes you really will see that ANYTHING is possible if you are willing to follow your dreams. Priscilla Houliston boarded a plane in Edinburgh, Scotland in May of 2006 to return to Pennsylvania, her native state, to help her mom recover from a massive stroke. It was unexpected and an eye-opener to Priscilla who was weighing 440 pounds, that if she didn't lose weight and get moving, she would be joining her mother in a hospital bed. Over the next six months while Priscilla and her mother bonded over daily rehab sessions that taught her mom how to speak, walk, eat and live again, Priscilla started taking a walk each day. 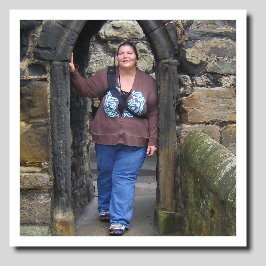 She knew she had to do something to change, but after failed dieting most of her adult life, she thought that being obese was something she couldn't change. Her daily walks changed something in her head. 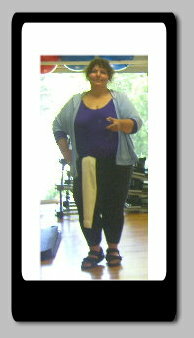 Realizing that exercise and movement was missing from her life and rather than thinking she had almost 300 pounds to lose, Priscilla broke things down in to lots of "little" changes. 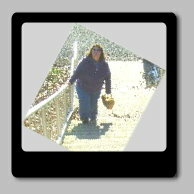 Keeping an online diary and connecting with others on this website, Priscilla was struck with the idea of walking around the country sharing with others who felt trapped in their bodies that EXERCISE was the magic pill everyone was looking for became Priscilla's goal! With her Scottish husband Morton joining her on the journey of their life, these two set off from Key West, Florida on January 1, 2007 with the goal of walking around the entire United States. Over the next six months they lived on the road, had daily miracles happen in their lives and met the most incredible people along the way. An accident ended their journey in Portland, Oregon in the autumn of 2007 putting the brakes on this adventure. Since the injury, Priscilla regained weight she had lost, suffered depression and in the summer of 2009, made a commitment to once again get on the ROAD to good health! This website is dedicated to that journey, that quest for good health and you are invited to come back and visit every day with Priscilla! Together, with little changes, anything is STILL possible! 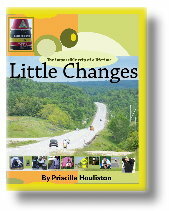 LittleChanges.com will continue to document the weight loss journey and adventure Priscilla is on. You are invited to email Priscilla with any thoughts or comments on her journey or yours! 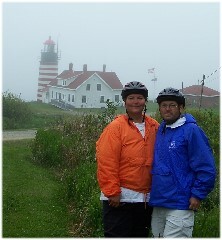 June 2007 - Quoddy Head, Maine with husband Morton, after bicycling over 3000 miles! The last seven years have been filled with amazing people, incredible times with my grandchildren and the hideous guilt that I was doing very bad things to my body abusing food. Since May 2014 I have been eating clean. Very clean. Basically, I eat fruit, vegetables, meat and eggs. My drink is water only. The great news is that since May 15th, I've lost 51 pounds without dieting or being hungry or buying some magic pill that doesn't work. My motivation is strong, my determination is focused and my journey continues. Thank you to those of you who care to watch, comment, join in and come along. I'm glad you're here!